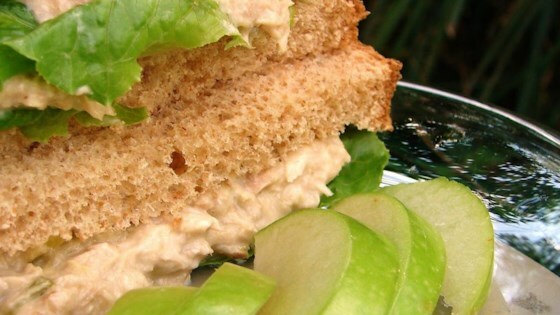 "Tired of boring tuna salad? You'll love this one!!!" Way too much apple! I used 2 cans of tuna and it was still overboard! Did not like the mustard in it, either. Keep looking for a good tuna salad recipe because this isn't it! Great recipe but I used canned chicken the second time rather than tuna and it tasted much better. I'd definitely recommend the chicken. It was great! What a refreshing change from our good old tuna salad. It can also translate well to chicken salad, etc. I made it as tuna-macaroni salad and got raves. This was one terrific tuna salad. I made it exactly as written except for the shallot, and served in half a ripe papaya. Cool and tasty! I'm doubling the recipe next time! This was a wonderful recipe -- the dressing on it was delicious. I used more tuna than it called for and served it at a brunch buffet as a salad, rather than in sandwiches. It was a big hit! Great change from the usual tuna salad. I used water packed tuna and left out the walnuts, and it was still very good.